holy cow…time flies when you are having fun! 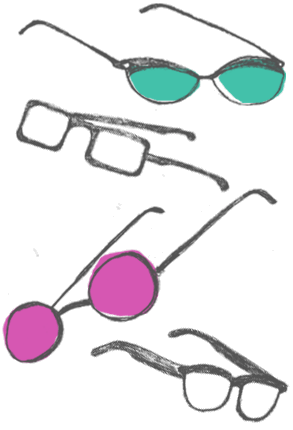 we love helping people pick out awesome glasses in fun shapes and colors…i guess we are having so much fun, that time has just slipped right by. we have consistently carried funky, handmade frames, and try to be as helpful and honest as we can. the only real big changes we have made over the years are, updating the interior of the store a bit, and trying to reuse, reduce and recycle everything in sight! sometimes i drive everyone crazy, re-using paper, not using plastic bags, using cloth napkins, etc., etc….but it’s worth it! we partied on 10/10 from 10-10 to celebrate…along with eating yummy cupcakes from Bleeding Heart Bakery, and making a few toasts with our customers and friends. mary did a great job decorating the store! we all had our party clothes on…..and as you can see, we couldn’t resist decorating for Halloween too:-) BOO!